After many months of following the progress of Jive Chime, first as a partner and prospective customer, and then as a member of the Jive team, it’s exciting to be helping to get the word out about a brand spanking new social communication product! So what is Jive Chime? 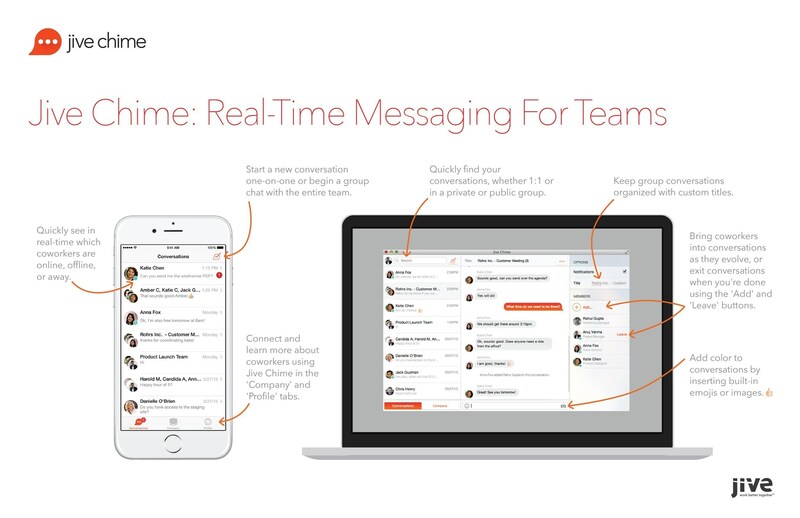 Jive Chime is a messaging app that lets you quickly and securely connect with teammates on the go, to get the answers you need, when you need them. Nothing revolutionary there I hear you say? We already have (insert the name of your favourite tool here… Lync/Sametime/Jabber/Slack/HipChat/WhatsApp etc), why do we need something else? Think of it as light-weight mobile and desktop messaging, with all the features you’d imagine – push notifications, 1:1 and group (public and private) chats, ability to name conversations, a vast palette of emojis, support for sending images, sync of conversation status across all devices, secure encryption, apps for iOS/Android/Mac and Windows etc etc. It is beautiful to look and super easy to pick up and use for the first time. But what’s the compelling reason for using Chime, I hear you ask? Jive Chime is free to use for individuals and companies. Any users that register using your company’s email domain automatically get networked. This makes it super easy to get your company network up and running, and connected to your colleagues. If you need more control, there’s a plan for you. Just $2 per user per month enables users to be managed from a centralised console, plus the ability for administrators to create/edit/deactivate users and to populate and edit profile fields. Therefore if you get great adoption of Chime (as we’re sure you will) across a department or location, then you can just move quickly and easily to a larger deployment with all the access and control you’d expect. That sounds awesome, how do I get started? Sign up at jivechime.com and download the apps today! But hey Stuart, we know you’ve been a big fan of Sametime and Slack in the past, how does it really stack up? I think it’s a stonking v1.0 release, that represents a truly enjoyable and flexible communication network. It’s free to use, has an incredibly low barrier to entry – sign up, download the app, invite your colleagues, you’re done! We’ve been using Chime internally as our primary communications channel since before I joined, and over 1 million messages have been sent. It really does fulfil the IM and group communication needs of a small to medium-sized business incredibly well. I would be the first to admit there’s a few features that I cannot wait to be added (editing of previous messages being one, an iPad native UI another), but the key features are all there, and are implemented in a very very sweet way. Jive Software have more than a decade of experience helping businesses develop and enhance their collaborative cultures, and Chime is just the latest product to demonstrate that experience and thinking – this time in a way that means entire organisations can be up and running in a matter of hours. What have you got to lose? It’s free to use, after all! That’s the problem with having so many social accounts – so many bios to update! Best of luck with the new job.. nothing like good competition. Stuart, Will try it out. You may want to stick a target=”_blank” for the links so one does not have to right click on your links to open a new tab. I’m lazy that way and figure so are my readers. And you may have wanted to include your email or how to connect with you on it as there is no way to add people or search for them as existing users. I half expected a upload your NAB or check my linkedin NAB for friends using it. So it does not allow for external people to interact with you? So how do you get your vendors and other clients to use it as well? No gateway exists I take it. Or does one need to be a jive customer and license external users? Regarding the user lookup… Chime is designed around intra-organisational use for the moment, so it makes it easy for organisations to enable users only to chat to colleagues via the application. If the advanced plan is taken, the the administrators can enable multiple domains, thus allowing for selected partners/customers etc to self-subscribe or to be added in bulk. There are ongoing discussions regarding support for looser organisations or online communities. However, for the moment, we see this as being a great solution for small to medium-sized organisations that would previously have implemented an on-prem solution, or perhaps have used public IM networks. OK, I get the advanced/pay up bit. That makes sense. As a small business owner, this would not work for me unless I paid for all my clients to use it with me. Something which I know from experience is not really going to fly usually unless I am Walmart and have some serious pull with a customer. From a team perspective, aside from the security, why is this different than Skype which is free and does audio and video too? At $2 a head one could get many options, even Sametime in SC. And I see your point, Keith. In Social 365 terms it wouldn’t have worked for me either, unless I gave all my partners @social365.com addresses. That’s one use case where today, Slack and others may work better. I know this is being actively discussed by the development team. That said, for some organisations, the restriction on adding non-approved externals is a positive – I know that sounds a bit backward, but thats how some orgs still work. Regarding comparisons with Skype and some of the other public networks. The significant issue there is finding others in your organisation. Given the millions that have Skype IDs, how do you find the right ‘John Smith’ that you need to connect with? You and I both know that this has been an ongoing problem for the past few years, that Microsoft doesn’t seem to show any interest in fixing. With Chime, you sign up with a form that takes 30 seconds to complete, verify your work email, and you’re instantly online with every colleague in your organisation that has previously registered. Very very fast time to value. If you have the paid plan, then that directory can be pre-populated. Looking at Sametime… You know I’ve used ST for years and have always had a love/hate relationship with it. For all its tremendous functionality and power, the client is anything but ‘light-weight’. In addition, despite IBM’s work on the mobile app, it is still primarily a desktop service. Sure, power users and admins may have the mobile app installed, but in my experience, very few end users do. Chime was built from the start to be a mobile-first service, to be as compelling and dynamic as using any of the most popular social network or IM apps. I don’t mean to knock Sametime, I’m just trying to mark the differences. Keith, I can see why Chime might be seen as derivative, and to some extent, you’re right. I also think everyone at Jive knows that it’s quite late to the game. However my own opinion is that for every one of the existing solutions in this space, there is a downside that potentially makes Chime relevant – the existing solution might be too heavy, insecure, lacking in mobile features, hard to get started, open to spam etc etc. Given my own knowledge of solutions and customer needs, I know that Chime will not be right for every organisation today, but for those looking for a free, fast and each-to-use mobile/desktop messaging app, this could be just what they need.